For the consumer who insists on nothing but the utmost in fashion, style, and durability. Color and design combined with the ultimate in performance. The patterns in this collection represent the most innovative designs Mannington has to offer. This flooring is designed to help you make a unique decorating statement. 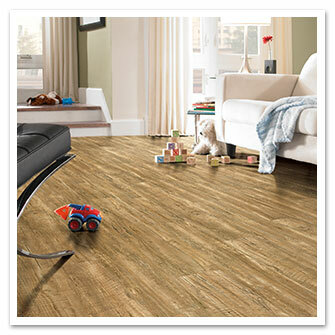 Offers award-winning styles, designs and sizes in both a wood or tile look. Not only is this floor durable but you can create your own winning design using the grout options. If your looking for a floor that performances look no further. This limestone based tile gives ease of maintenance, strength and durability you desire. DuraCeramic is warm to the touch compared to ceramic thus saving you from stepping on a cold floor in the morning. Available in many different patterns and colors to create the floor of your dreams. This company has pulled out all the stops to create a realistic wood and tile look luxury vinyl floor. This stylish product comes in various sizes and has an attached cork underlayment. The cork allows the flooring to be installed over various substrates. CoreTech is mildew and mold resistant, kid and pet resistant. Alterna is a timeless luxury vinyl tile. It has many realistic slate, marble and travertine loos to create an elegant floor that will be easy to live with. Alterna is avaliable in many different sizes to inspire your creative side and design a unique floor your friends will envy. This luxurious cushion sheet vinyl floor comes in unique and realistic designs that will add pizzazz to any room of your home. Not only is floor easy to clean but also durable.